Tushita-Mandala-Calendar 2006, 2009. 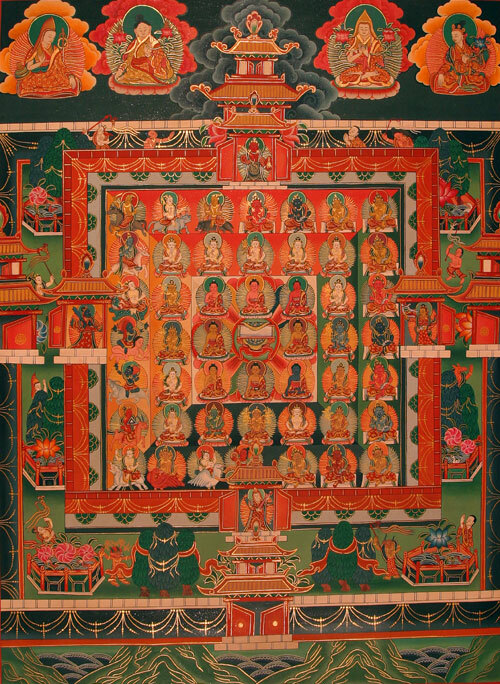 Dieses fabelhafte 52 Götter Bhaisajyaguru-Mandala mit der Bhaisajyaguru-Sutra im Zentrum ist ein wirklich außergwöhnliches Stück. Außer Buddha Shakyamuni sind noch die 7 Heilbuddhas im 1. Abschnitt zu sehen, sowie viele weitere Buddha-Aspekte. Dieses Mandala war die Druckvorlage für die Darstellung im Tushita-Kalender. Kleinere Farbabweichungen im Kalender sind möglich. This thangka depicts a fifty-two-deity Bhaisajyaguru Mandala, with the Bhaisajyaguru-sutra in the centre. Buddha Shakyamuni and seven Healing-Buddhas are in the first sector. In addition, many other gods and characters are depicted This mandala was the template for printing the Tushita calendar. Minor color variations are possible in the calendar.